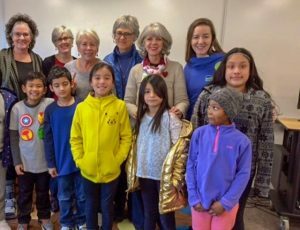 With the same twelve students on the two day a week after school program, filling the need for one-on-one engagement can be a volunteer management challenge. Securing 24+/- tutors would seem to be a daunting task. A rewarding effort is an easy sell. This year six 5th graders move on to middle school. As with any relationship, visiting with a student over the school year, creates a bond that reveals the ‘big picture’ to volunteers. 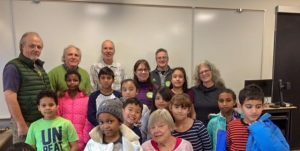 With the wonderful diversity that is Olympic Hills Elementary, opportunity reveals the perfect volunteer experience. At first, awkward and maybe a little bit uncomfortable. Once the computer laptops are on, and print resources, special projects (like a poetry project or a special interest newsletter) are engaged, the smiles, laughs and friendly conversation take over. Childhood experiences and familial traditions are a delightful reveal to both the student and the tutor. Each year a group picture is put together. For tutors, these are where the memories last a lifetime. Good work students and a BIG thanks to tutors.